GreatCall Link keeps you informed about the health and safety of senior family members that have a GreatCall device, right on your iPhone. Keep up-to-date when you want without disturbing them – helping them stay healthy, safe and independent. •	Receive alerts when an emergency call is made to 5Star until the call has been resolved. •	Know the battery level status of a connected GreatCall device. •	See a list of “zone” locations recently visited. •	Get a current map location of the device. •	Weekly summaries of device activities based your family member’s actions and behaviors. •	Know the battery level status of the connected device. •	See completed daily health and fitness challenges. •	Send activity likes and encouragements to your connected family member’s Lively Wearable app. The GreatCall Link app on your iPhone and a GreatCall Link-enabled device work together to keep the whole family connected, informed and independent. Tap the top right refresh button within the app to receive the latest information about the user’s device. Open the GreatCall Link app your iPhone and know immediately if the user’s device (Jitterbug Phone, Lively Mobile Medical Alert or Lively Wearable) is on, off, or charging. No more wondering if it needs to be charged or if the battery needs replacing. You’ll even get an alert when the battery reaches critical level, so you can remind them to recharge or replace the battery and remain connected to help. Be in the know. 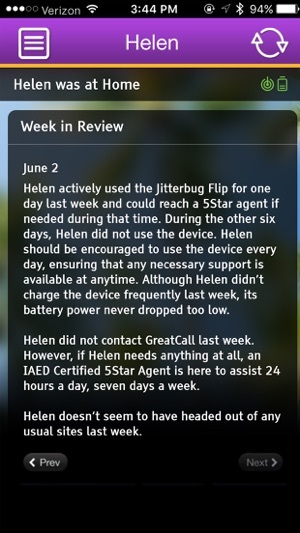 Link will send you notifications for selected actions including when 5Star is utilized, allowing you to make decisions quickly and follow up without delay. Each notification will identify the reason 5Star was contacted and will update you ever 30 seconds until the call has been resolved. It’s all about location. 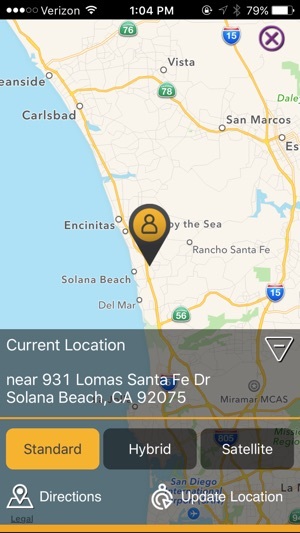 When GPS location is on, both you and first responders can see the connected device’s location on a map. In an emergency, this information can save crucial minutes and seconds. Use your iPhone navigation system to get directions to the connected device’s location without having to call. 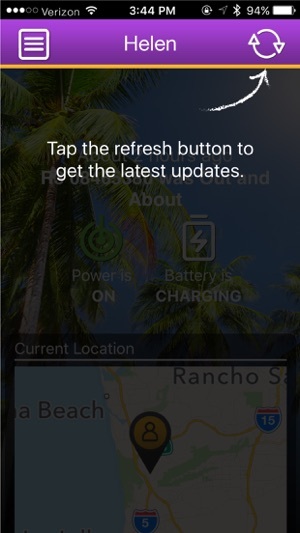 To maximize the battery performance of the user's device, location information is only updated once every 20 minutes by design. However, the latest location of the device can be retrieved at any time by tapping the "Update Location" button while viewing the map. Make sure routines are normal. 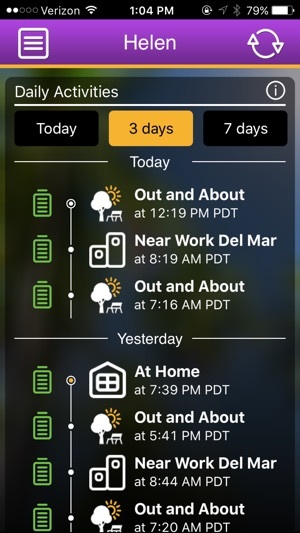 For the Jitterbug Flip, Jitterbug Smart and Lively Mobile, based on information in the Personal Profile, it’s easy to see if appointments are being kept or if there is a change in daily activity. For the Lively Wearable, you can see if the device user has completed their daily health and fitness challenges. For the Lively Wearable device user, you can send encouragements and likes for their daily fitness challenges. I used this app for a few weeks and I'm finding ways to get what I need from it. From the reviews, I'd say expectations are a little high. I get reasonable results by closing the app between uses. I don't logout, I just bring up my list of loaded apps and "X" this one so that it opens fresh each time. To get a current location update, I open the app and click the refresh button. After it starts showing dots across the screen, I close the app ("X" out from the list of loaded apps). When I reload the app 5 minutes later, the updated location is available. I don't know why it takes time. Maybe it's a batch operation running on a mainframe computer. We get piece of mind from this app, in spite of the fact that results aren't instantly available. The service that answers calls seems terrific. We are very satisfied. If you seek software perfection, you may need to keep looking. This isn't self-contained technology like some game on your phone. You're trying to track down an inexpensive cellular device that may be roaming between cell towers. This one isn't perfect but it does the job and the app costs nothing. Has gone from excellent to TRASH. Have been a very happy user for FOUR YEARS until lately. Am still researching, talking with tech support, and am actually riding around to field test problems. We used to get 95%+ success in locating wearer. Now we get maybe 10% success. Same house. Same car. Same town. Same frequent destinations. Small town. No new developments. There is a Verizon tower about 2 and 1/2 miles from house. It appears the issue is that the Lively Mobile device is 3G technology and what Verizon tells me is it gets lowest priority on 4G towers so it will be slower and slower to update and may get shut out entirely during more busy times. That explains why sometimes ( rarely now) it succeeds in seconds and other times ( more frequently) it tries forever and still fails. As more towers convert to 4G these other reviewers that are singing it's praises as I once did will be left behind as well. As per just the app, it too is flawed. The info it gives you does NOT really mean what it says. It could be HOURS old yet it tells you wearer was at a location, say, 10 minutes ago. It simply IGNORES all the failed attempts. There is more; that's just one example. I may update after field test. System is failing. App doesn't account for failure thus making it inaccurate. Poor phone team. Too long 2get info & get help. Pushed my button. Immediately said a White male was in my yard, coming at me. She had to KNOW every detail FIRST before contacting 911. The guy is running toward me. I don’t have time to give details when running. 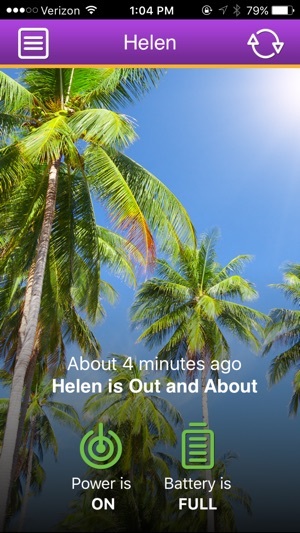 Also, SHE personally did NOTneed the particulars. JUST START A POLICE CAR !!!! EVERYTIME I have had an emergency they have done this. The purpose of having the Device is to GET help STARTED not have a conversation. I laid it done and called 911 myself. What if I were unconscious or dead by this FELON’s hands and she’s still talking !! She doesn’t need to know the details at this point, UNTIL SHE KNOWS that I am alright and safe. Just get me help. My small kept nipping at his heels until he backed him out of the yard until he jumped over my fence and ran. Had the nearby Police dept and My local Police deptand the County Sherrif dept with their dogs, I would have been in my back yard with him. They were a block away, hunting him for a stolen truck in the neighboring City. What a shame! I felt protected by having this device and now I know I am NOT SAFE, Nor protected and I can get better response by ME calling 911. The only thing good about it was when GreatCall answered me, audibly, he thought I had. Line to the Police. What a shame! And I pay good money for this. We are sorry to hear that you have encountered a problem, please email your account information and a description of the problem to appsupport@greatcall.com.